For some, the dream of having a smile full of sparkling, straight teeth can seem like exactly that—a dream. In the past, many working professionals and image-conscious young adults have skipped having their misaligned teeth straightened because they didn’t want to commit to years of treatment with metal braces. That’s why our Massapequa cosmetic dentist offers something different—Invisalign clear orthodontics. 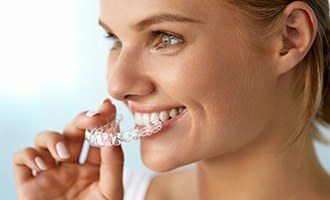 With Invisalign clear orthodontics, patients who have been looking for an alternative to standard braces don’t have to look any further. As an excellent alternative to traditional orthodontics, Invisalign can provide care that looks more natural, feels more comfortable, and produces quicker results. How quickly can I get results? Using a custom-made Invisalign treatment plan, our team can have your treatment completed in an average time of just one year, as opposed to the two years or more that most traditional braces take. Afterwards, with your orthodontic treatment complete, you can finally have the straight, beautiful smile you’ve dreamed of for so long. Traditional braces use metal brackets and wires to gradually bring teeth into their ideal alignment. But not Invisalign. Instead, Invisalign uses a series of clear aligners. Each aligner is made to be worn for about two weeks and is intended to help you at a specific moment in your treatment. When that two-week period is up, you’ll move on to the next aligner, or pair of aligners, in your kit until your treatment is complete. Besides taking your aligner out to move from one to the next, you can also take them out to eat, brush, and floss. That means you can still enjoy all of your favorite foods during treatment. It also means that you can easily keep your aligners and your own teeth clean. Brackets and wires make thorough brushing and flossing difficult. But with Invisalign, an effective home care regimen is just as easy as it always was. Patients who have worn metal braces can tell you—they are very uncomfortable. Not only do patients with traditional braces have to come in and have their braces tightened, traditional braces can also cause irritation to the inside of your mouth and gums. Experiences with Invisalign are much different. Because your Invisalign aligners will be custom-made from detailed impressions, you can look forward to a more comfortable fit. What’s more, Invisalign is made from smooth plastic instead of metal, reducing the discomfort associated with orthodontics. Metal brackets and wires can cause you to feel embarrassed about your smile in the same way that misaligned teeth can. Reactions to Invisalign are completely different. Because it is clear, people will hardly notice your Invisalign braces. Plus, if you have a big event coming up, like a wedding or a family reunion, you can go without your aligners for a night as well, allowing you to look your best when it matters the most. Thanks to Invisalign, now more people can get the straighter smiles they’ve always wanted without having to alter their daily lives. It’s the perfect modern solution for both adults and teens alike. To see if Invisalign is right for your smile, simply contact us today.